World number two Nadal lost 6-3 3-6 7-5 to Fernando Verdasco in round three and blamed the slippery courts for his first defeat in 23 matches on clay. 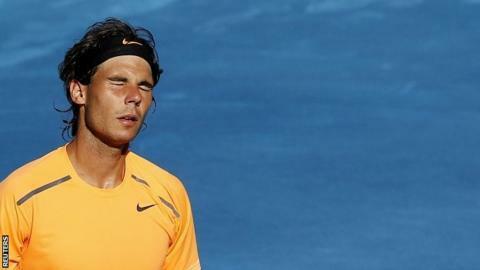 "If things continue, [there] will be one less tournament in my calendar," said the Spaniard. Djokovic said he agreed with Nadal after he and Roger Federer progressed to the quarter-finals. "Regardless of the rights or wrongs, the playing field here in Madrid is suddenly a more level one - ice-rink-level, you could say, and most certainly blue." Federer expressed sympathy with Nadal over the issue. "I understand his disappointment," said the Swiss. "He was against (blue clay) from the start and so was I. He never felt comfortable on the surface. It is a tough surface and that can only add to the anger even more." Nadal, who had won all of his previous 14 meetings against 15th seed Verdasco, blew a 5-2 lead in the third set on his way to his earliest exit in a clay-court tournament since he fell to Juan Carlos Ferrero in Rome in 2008 - and prior to that he had not lost at such an early stage on clay since 2004. "After losing so many times against the best player on clay ever, to beat him on clay is the maximum," said an emotional Verdasco. "I don't have words. I am happy for the win, although it is difficult to hold myself together now. I need to calm down, rest and get ready for the next match." But while Verdasco was left celebrating his shock victory, Nadal was complaining about having to play on a surface which is different from the red clay courts used at other tournaments, including the French Open starting later this month. Organisers say it makes it easier for television viewers to follow the balls, but Nadal is not convinced. "The movements are important for me and here I cannot move so I cannot hit the ball the way that I want," he said. The blue clay is extracted from crushed brick, and the material is stripped of its iron oxide before being dyed. The process involved has made the blue court feel much slicker than the traditional red clay. "I think the tournament is great but that [changing the courts] is a bad decision. If you put the Cincinnati tournament on grass just before the US Open, do you think people are going to be happy? I don't think so. "I am not prepared to risk something happening next year if nothing changes." Djokovic, who beat Stanislas Wawrinka 7-6 6-4, was also asked about his future participation in the Masters event and he said he was of the "same" opinion as Nadal. "You are tripping and slipping and sliding all the time and the winner will be the one who doesn't get hurt until the end of the week because a lot of players fell down," he added. Federer, who beat Richard Gasquet 6-3 6-2, will face David Ferrer in the quarter-finals after the Spaniard beat countryman Nicolas Almagro 7-6 3-6 7-6. Switzerland's Federer will overtake Nadal as world number two behind Djokovic if he wins in Madrid. Djokovic will next play either fellow Serb Janko Tipsarevic or Gilles Simon of France, while Verdasco will face Tomas Berdych after the Czech beat Gael Monfils 6-1 6-1. There was another surprise in the men's draw as Ukraine's Alexandr Dolgopolov knocked out fourth seed Jo-Wilfried Tsonga of France. Dolgopolov, seeded 16th, won 7-5 3-6 7-6 (7-2) to book a last-eight match with Argentina's Juan Martin del Potro, who beat Croatian Marin Cilic 6-2 6-4. In the women's draw, ninth seed Serena Williams staged a recovery to claim a 1-6 6-3 6-2 victory against Caroline Wozniacki, who was seeded sixth and is also a former world number one. "Williams is a great opponent but to be honest I am just happy that my foot's feeling better, you know I hurt it in the first match," said Wozniacki. "I think I can take a lot of confidence from this match leading into the French Open, which is coming up soon." Williams now has a quarter-final against second seed Maria Sharapova, who progressed after Lucie Safarova withdrew before their third round match due to a stomach illness.